When grilling season rolls around, get your creative juices flowing by whipping up a new and interesting burger! 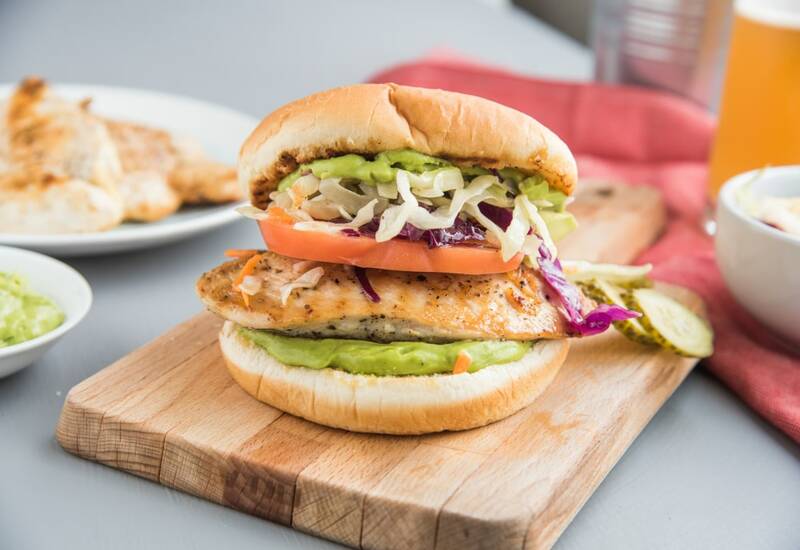 This grilled chicken burger is a delicious and easy weekend meal or fun weeknight dinner. If you love putting slices of avocado on your burger, this avocado aioli is right up your alley. Instead of just a leaf of lettuce, these burgers boast an easy cabbage slaw topping. Serve on warm, toasted buns and this is a meal your family will absolutely love! For juicy, evenly cooked chicken, pound the breast halves to an even thickness. Also make sure your grill is clean and oiled before grilling any meal. Per Serving: 740 calories; 44g fat; 44.4g carbohydrates; 44g protein; 102mg cholesterol; 514mg sodium. The slaw and avocado aioli is a perfect way to spice up chicken breast when you eat as much as I do. Quick, easy, fresh and delicious. For a spicy kick, just add a splash of sriracha to the aioli like i did. Quick and easy chicken sandwich recipe. Perfect on the grill or in a skillet. It's a great weeknight meal because it's really quick to prepare. This was my first time making avocado aioli and it was really easy and delicious. These chicken burgers were also very juicy and tender. This is a great family friendly recipe, and I need to make them more often. This is a chicken sandwich, not a burger, but it was tasty. The avocado aioli was really good. Could have seasoned the chicken with at least salt and pepper, but other than that this was OK.
Great recipe! I also put the bun on the grill in order to toast it slightly. Store bought cabbage slaw works well too, if you don't want to make your own.